Because headaches are so common, some people think that a headache is just a normal part of life! This is not true and we can help; Most likely change your life! A headache is a sign that somethings wrong. Misalignment of spinal bones, stress, toxic fumes, certain foods, preservatives, hormones and alcohol are common culprits. Imbalance and unequal Qi’, addressed through acupuncture are often found to be present. 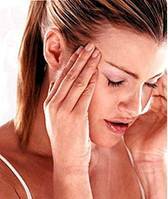 A very common cause of a migraine is a “rebound headache” from headache medication. Interesting huh? Headaches are not the result of an aspirin shortage in your body! Drugs only cover up the symptoms and do not address the cause of headache pain. A frequent and overlooked cause of headaches is the misalignment of spinal bones in the neck and upper back and or an imbalance in the Qi’ in the body (which is what Acupuncture treats). When bones of the spine lose their normal position or motion, sensitive nerves and blood vessels to the head can be affected. When spinal nerves and related tissues are stretches or irritated, they can produce migraine headaches. Other potential cause include both hormone and chemical imbalances in the body that acupuncture or specific nutrition or herbs may treat. If a thorough examination reveals reduced range of motion, loss of normal spinal curves, mechanical restrictions, chiropractic care should be considered to treat the headaches. If Qi’ imbalances are found which relate to the innate “energy” of the body then acupuncture should be considered. How can Acupuncture be an Effective Treatment for Migraines? “After having a headache/migraines for 2 1/2 to 3 years I walked into Advanced Sports and Family Chiropractic and Acupuncture looking for help. Because of my headaches I was taking a lot of OTC remedies and then a lot of OTC remedies for my stomach problems. It would also be good for you to know that I am not a big believer in our medical system and I refuse to allow any doctor to do intrusive tests so that they can guess what might be wrong and then they can prescribe numerous drugs to see if they might help. Dr. Woodle did an x-ray (nonintrusive) and found several things that needed attention. I had been in a car wreck when I was a junior in high school and was never given treatment on my upper neck. I am now 64 years old and my neck really needs attention. I also had a jaw injury for high school that he worked on. My stomach issues were so bad that I was taking a lot of antacids a day and not really getting much relief. I did not know that antacids blocked your system from absorbing iron. My hemoglobin level was an 8.2 when 12-15 is recommended. I was taking 4 to 6 Excedrine Migraine a day and most days adding in 50mg of Imitrex. Needless to say that was the major reason for my stomach issues.